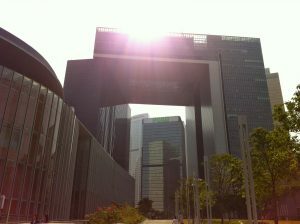 This is the Central Government Complex, headquarters of the Government of Hong Kong since 2011. 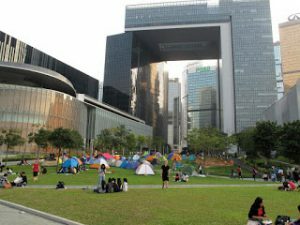 After the controversial and difficult times in Hong Kong in 2014 when a sit-in protest was staged by students, I did some research on the original location where the protest began. “Central Government Offices 201308” by Wing1990hk – Own work. I first visited this building when I was in Hong Kong shortly after it opened in 2012. 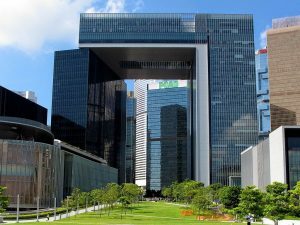 At that time I didn’t make the connection, but after the protest I was sure – this building is the cause of the ‘Occupy Central’ protest! In Feng Shui we talk about what is called the ‘Open Mouth Sha’ – that is, any form in the landscape that looks like an open mouth. Under certain conditions this type of feature can provoke ‘juniors’ to challenge ‘seniors’; or workers to challenge the boss, or in this case, students to challenge the government. I’m looking forward to returning to Hong Kong with my tour group at the end of this month.